Off-scale sensors consist of two piezoelectric sensors that are installed on either side of the in-motion sensor array or weighbridge. When a passing vehicle actuates one of these sensors it is an indication that the vehicle has not passed fully over the sensor array or weighbridge and that the weight readings are likely to be incorrect. These sensors are used when there is no physical barrier along the travel lane that keeps the vehicle centered in the lane. 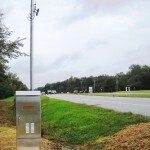 The over-height detector consists of a pole-mounted receiver/transmitter on the instrumentation side of the travel lane and a pole-mounted reflector on the opposite side of the lane. An infrared beam is transmitted across the travel lane and reflected back across to the receiver. When a passing vehicle breaks the beam, the controller senses the absence of the reflected beam and signals an over-height condition. This over-height condition is indicated in the operator display for the virtual weigh station and in the highway weigh station signaling the officer of the condition. 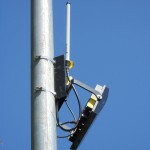 Note that mounting poles and bases are normally not included but can be at extra cost. When the in-motion scale is located in relatively close proximity to a calibrated static scale, it is possible to automatically calibrate the in-motion scale based on the static scale weights. To do this, transponder-carrying vehicles are identified at the in-motion scale and again at the static scale. The weights from the two scales are compared and the difference noted. After a preselected sample of weight data has been obtained, the in-motion scale calibration is automatically adjusted to bring it into agreement with the static scale. Note that only gross vehicle weights are used for the comparison. When this system is used, average errors are brought down to around 1.5% or so. This option includes two tag readers, a PC with special software and requires a serial connection between the in-motion scale and the PC at the static scale. Many installations utilizing in-motion scales require the control of vehicle movement within the facility. Each installation is unique and may contain a number of lanes and junctions. Cardinal engineers can design a system to direct vehicles through the facility by using directional traffic lights and inductive loops to sense the presence of the vehicles. A Programmable Logic Controller (PLC) with an associated touch screen terminal provides automatic control as well as manual functions. Since each system is custom, it is necessary to provide a layout drawing of the travel lanes along with a description of how the traffic is to be controlled. (We can also determine this on a site visit if necessary.) Once this information is available, we can provide you with a solution. If you need to have a relatively inexpensive means of positively identifying vehicles as they pass over your in-motion vehicle scale, consider the use of rf identification tags. These passive tags are located in the windshield of each vehicle and are read by a compatible tag reader located at the scale. A unique identification number is programmed into each tag allowing you to track your vehicles. The vehicle identification becomes part of the vehicle record enabling tracking of vehicles and monitoring their loads. 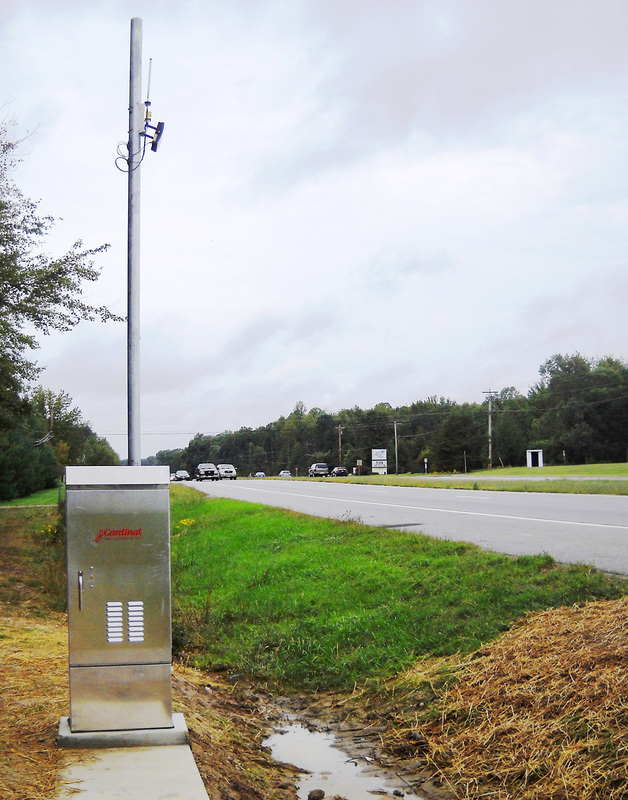 The Automatic License Plate Reader (ALPR) consists of a couple of high-resolution high-speed cameras and image recognition software to detect and read the license plate of the vehicle passing over the in-motion scale. These readers are designed to function both in darkness and daylight at highway speeds. An overview image of the vehicle and detailed image of the plate is provided. The license plate information can be used to positively identify the vehicle and, when used with an appropriate database can be used to identify those vehicles with outstanding warrants, safety violations or other infractions. 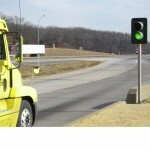 The US DOT number reader is able to read the US DOT number from the side of a passing commercial vehicle and moderate speeds in both daylight and darkness. Operating in a similar fashion to the ALPR, the capture of the US DOT number provides positive identification of the passing vehicle and the ability to interrogate various databases to obtain additional information about the vehicle. 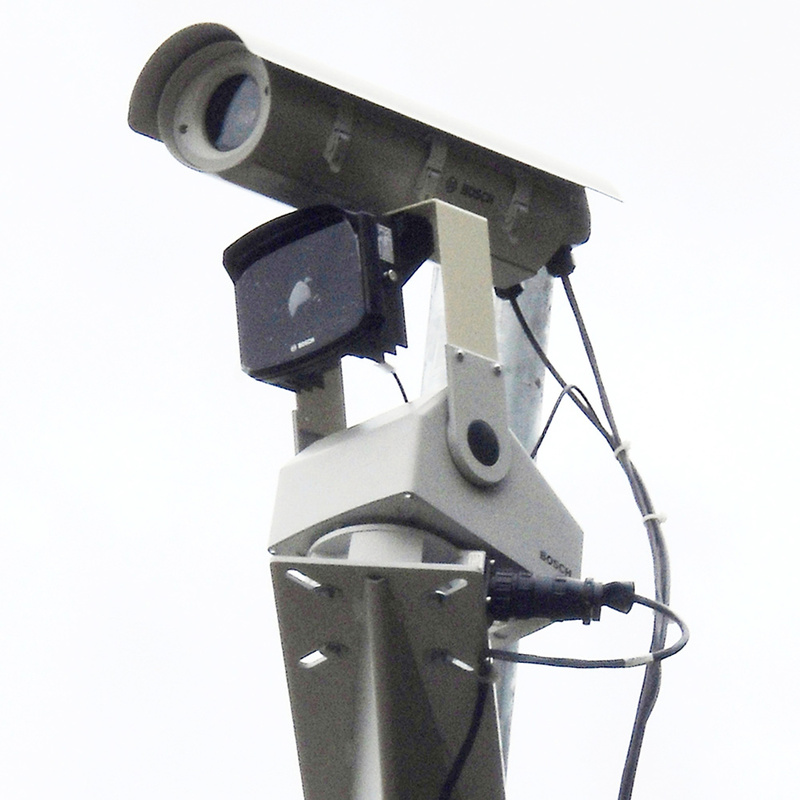 Cameras are available to capture images of the vehicles as they pass over the in-motion scale sensor array. The cameras offered product color images during day time and black and white images at night. Unless there is sufficient ambient illumination, we recommend the use of an infrared illuminator with the camera to ensure adequate night time illumination. A choice of lenses, drives, mounts, and resolution are available with these cameras. 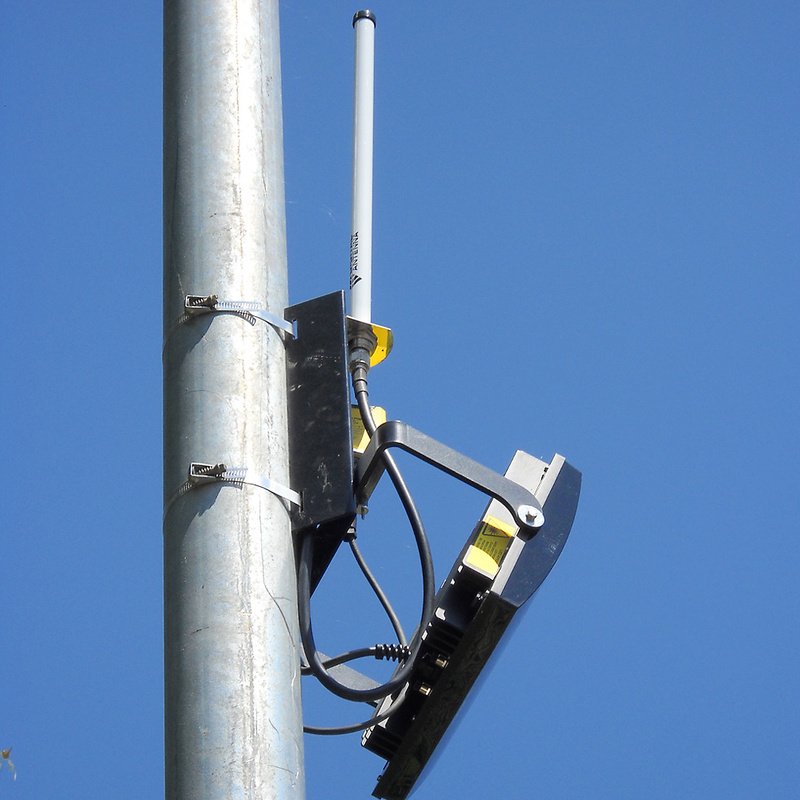 These cameras are normally pole-mounted but can be mounted on other available structures. Cardinal offers a family of remote displays that can be used to display the gross weight or axle weights for the vehicle drivers. These displays range in character height from a half inch up to 5 inches each with its own set of unique features. Inductive loop detectors are available for installation in the travel lane to sense the presence of a vehicle. These loop detectors, as the name suggests, use several loops of wire embedded in the pavement. The change in inductance of this loop resulting from the close proximity of a ferrous structure (like a vehicle) is sensed and an output turned on to signal the presence of the vehicle. Multiple loop detectors can be used in conjunction with a PLC to track a vehicle through a commercial vehicle enforcement facility or they can simply be used to turn travel lane signals or stop lights on and off. Cardinal maintains a staff of professional software engineers who can custom design and commission software application programs to your specific requirements. For custom quotes on WIM systems, please e-mail wim@cardet.com or call (800) 441-4237.